The All American Electric Sterilizer 25X-240V is a complete, self-contained unit with an immersion heating element, automatic thermostatic control, automatic release valve, and pilot light. It connects to any outlet, is ready for use instantly, and ensures complete, efficient sterilization. 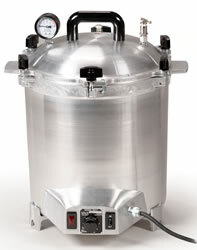 Only All American Sterilizers feature an exclusive, precision machined "Metal-to-Metal" sealing system. Positive action clamping locks align the cover to the base forming a steam tight seal. Because no gasket is involved, the cover is always easily opened and closed. Only a small amount of water is needed to create the dry steam. After achieving a minimum temperature of 250°F(121°C), and a pressure of 17psi, the dry steam penetrates the bandages or instruments, making them sterile in just 35 minutes and ready for immediate use. No wiping is necessary to remove chemical residue or moisture, and will not dull cutting edges. Includes removable aluminum inner container with rack and instruction book.